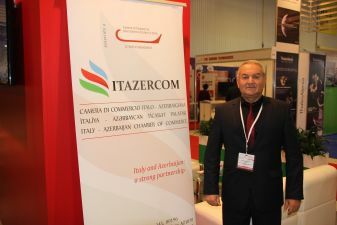 Italy-Azerbaijan Chamber of Commerce (Itazercom) represents several Italian telecommunications companies at Bakutel. Among them are ELETTRONICA and its subsidiary CY4GATE, as well as companies DBA Group and GEM elletronica. ELETTRONICA is the world leader in Cyber ​​Electronic Warfare with a full range of advanced solutions to meet the most complex operating system requirements. Italian CY4GATE is about five years old and is a joint venture of ELETTRONICA and Expert System - a world leader in innovative solutions based on semantic intelligence. Their new popular project is "360 * Project in the 5th Domain". In general, ELETTRONICA created 2,700 cyber-systems, which were delivered to almost 30 countries of the world. Private DBA Group offers IT-services, in particular, on web-design, maintenance of software and database, hosting, server virtualization, IT-outsourcing services and network security. GEM elettronica produces state-of-the-art safety equipment and positions itself as a major European player in the field of photonics, offering customers products with sophisticated and innovative technologies at competitive prices, including fiber-optic gyros (FOG), active lasers and inertial navigation systems. All these companies are interested in developing business in Azerbaijan and hope that the Bakutel exhibition will help in this.